The Internet has definitely changed the way we carry out our day to day activities, be it something as simple as communicating with a friend, or the more critical applications such as banking and healthcare. The benefits of connecting more and more devices to the Internet, popularly known as the Internet of Things (IoT), are manifold. As an example, your keychain can broadcast its location, helping you to find the key you lost by clicking on an app on your smartphone. However, as more and more things get connected, there are new requirements in network protocols, security, programmability, etc. Favor is a simple and powerful library for IoT, which hides the complex and inconsistent interfaces provided by heterogeneous devices, from the app developer. The single API provided to access these devices makes it simple for the developer to control various devices. As narrated in the official documentation, if you wish to have a function like reading temperature from various heterogeneous devices without considering their hardware differences, using commands similar to what’s shown below, then Favor is the library that will assist you. The Favor documentation uses the term hardware agnostic, which implies that developers can write the business logic of the app without thinking about the actual hardware in which the code is going to get executed. Presently, Favor supports devices of Linux origin such as Raspberry Pi, Beaglebone, etc. However, any Linux device with the ability to run Node.js can be used. Favor is able to achieve the hardware agnostic feature by maintaining a configuration file. This consists of details describing the structure of the hardware. Favor queries this configuration file when communicating with the actual device. This functionality could be compared with how jQuery parses and interacts with the DOM of a Web page. Once the parsing is done, then jQuery is capable of accessing any DOM element with the simple $ functionality. Uniform and simple API for communicating across various devices/protocols. Clear demarcation between hardware and software, which increases the modularity of the application. It separates the business logic from the hardware. The ‘Write Once – Run Anywhere’ feature makes it more suitable for a variety of application scenarios. Code is actively updated at frequent intervals. JerryScript is ECMAScript 5.1 standards compliant. Highly optimised for low memory consumption. JerryScript is open source and available with the Apache License 2.0. Written in C99 for maximum portability. JerryScript was developed from scratch by the Samsung Open Source Group. It uses libuv for asynchronous input and output, which is a multi-platform support library to enable asynchronous I/O. 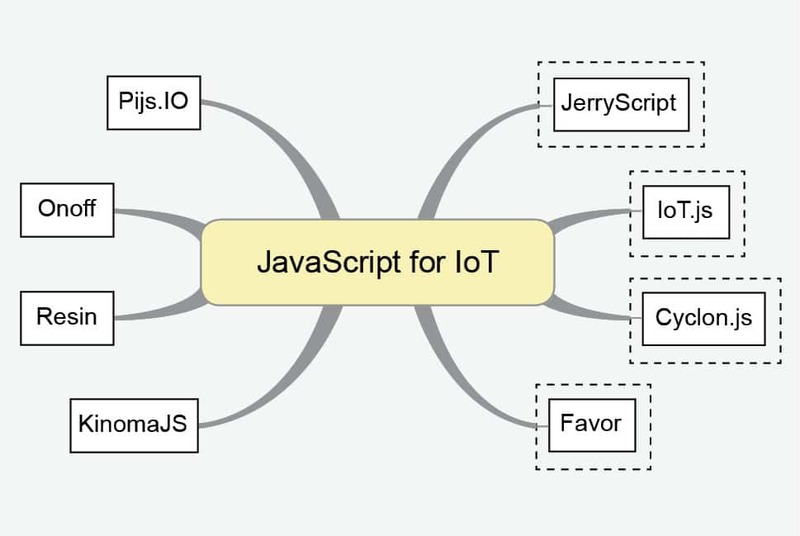 Presently, IoT.js supports Linux and NuttX. The latter is a real-time operating system. The API provides features to handle buffers, events, consoles, GPIO, streams, timers, etc. Cyclon.js can be executed from a browser with the help of the browserify module of npm. The author is an assistant professor of computer science at, School of Engineering and Technology, Pondicherry Central University, with over 10 years of experience in both academia and industry. He has been awarded the Best Teacher Award three times in 2010, 2011 and 2013.